The ROCCI in conjunction with FNB, hosted their Annual Business of the Year Awards on 5 November 2016 at Silverstar Casino where FlowCentric Technologies scooped Gold in the Technology Category. The annual ROCCI/FNB Business of the Year Awards acknowledge organisations that have not only achieved success, but those that which embody the spirit of enterprise and are committed towards building a strong economy. 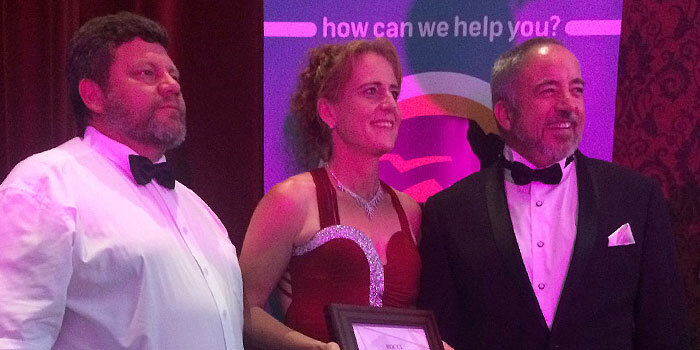 The Award was accepted by FlowCentric Technologies management, Jacques Wessels, Odette Pieters and Denis Bensch. “Thank you to ROCCI and FNB for the recognition and to all our employees, partners and customers for their continuing support.” stated Jacques Wessels, CEO FlowCentric Technologies. 2016 has already been quite a year for the FlowCentric Technologies team. The company was named Famous Brands IT Supplier of the Year in May, and moved into their newly developed offices in September.